This is the first of a weekly post that I make about a random puzzle from my collection. 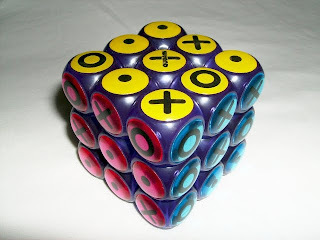 This week its the Megaminx (a.k.a. Hungarian Supernova), one of my top 5 favorite puzzles. It was not invented by only one person, because several people invented it around the same time and no one can claim its exclusive rights. 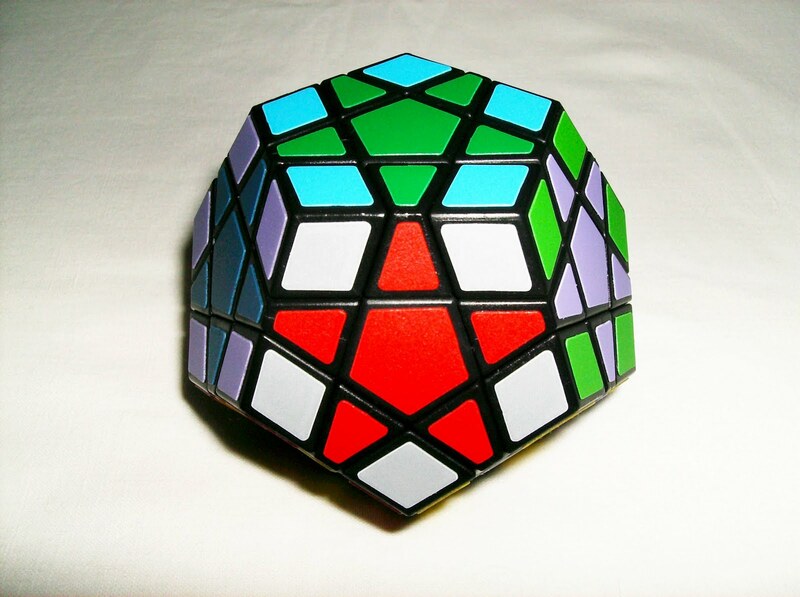 Belonging to the family of the Dodecahedron, this 12-sided puzzle has a mechanism similar to the Rubik's cube and also has the same difficulty level. 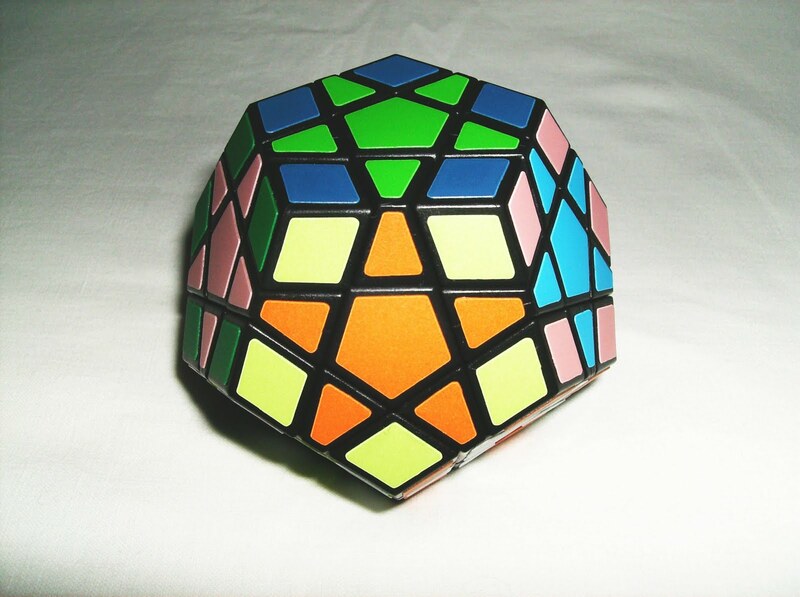 The one pictured in this post is a Puzl 12 color Megaminx and can be used for speedsolve. It's very easy to turn and feels great to the touch. 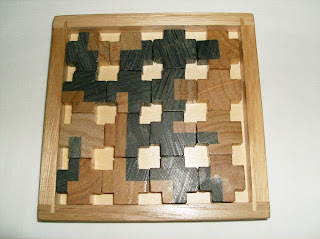 You can also make very nice patterns with it that will turn it into an even more aesthetically pleasing puzzle. Also available from Puzzle Master. 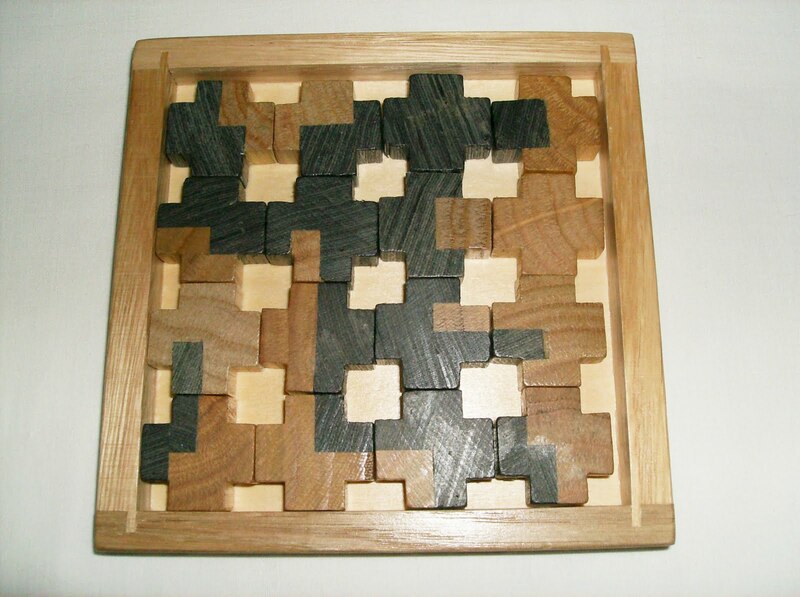 Rekubus is another great puzzle that I recently discovered and was entered at the 2008 28th IPP Design Competition. It's an assembly (put together) puzzle and the goal is, of course, to make a cube with its 38 pieces. At first glance nothing extraordinary there, but if you have two or more cubes, the puzzle gains another dimension. 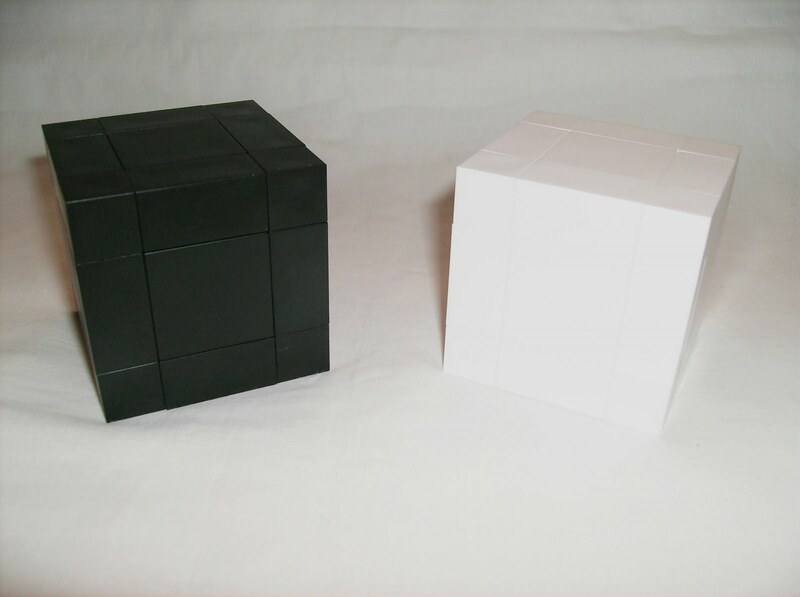 One of the possible challenges you can make with multiple cubes, is to swap pieces between them, making a wide range of these interesting patterns of contrast. Another challenge is to create different structures, other than just a cube. This one gets really interesting when you have 4 or more cubes. You can create a bigger cube with four single cubes or you can also make a tower. 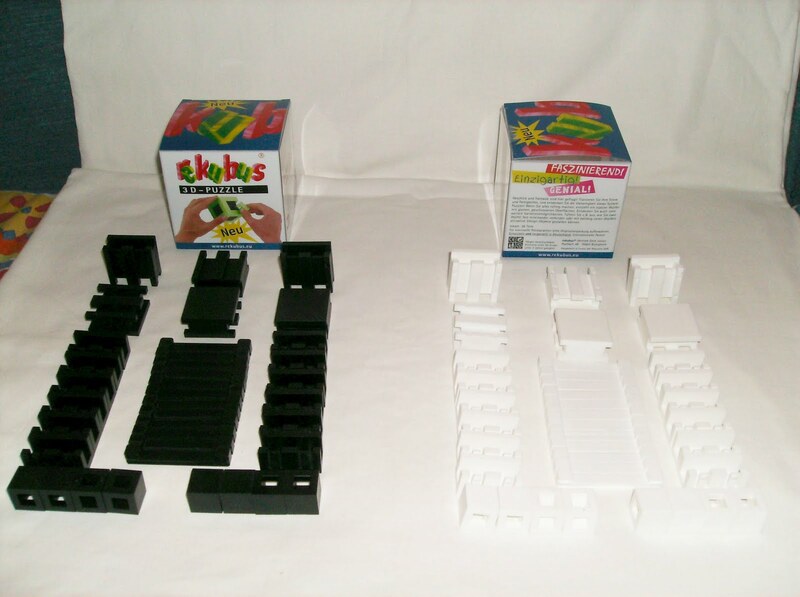 There's no limit to what you can do with multiple Rekubus cubes. The company makes several different solid color cubes and multiple colored ones, so you can choose which colors make the best contrast patterns. 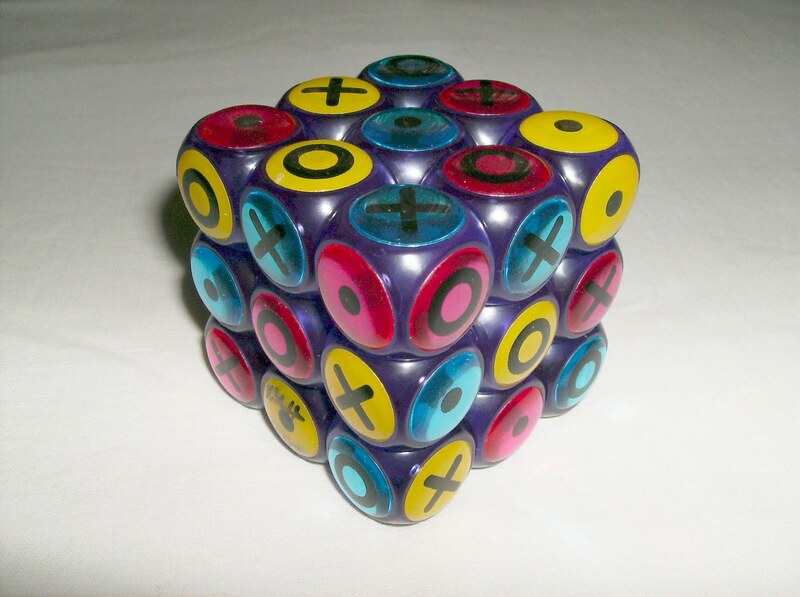 Besides the color cubes, it's also available a cube with numbers that have three difficulty levels. 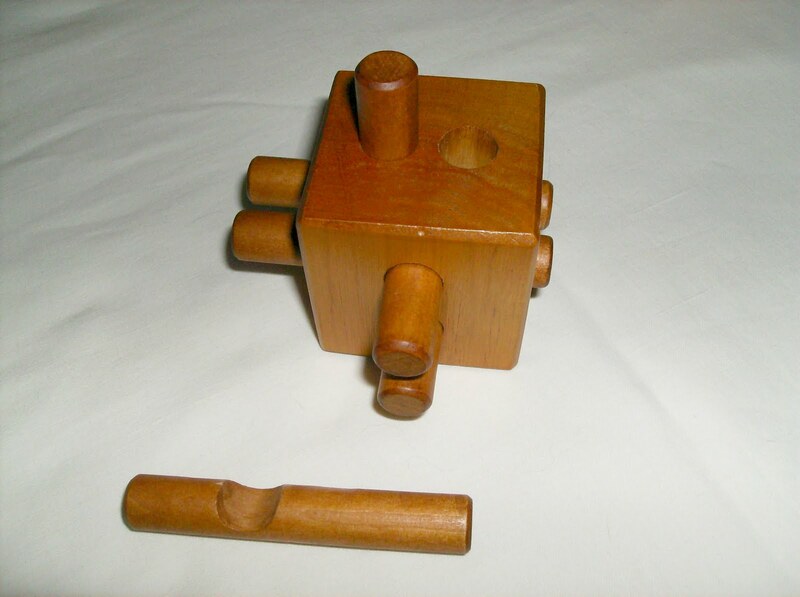 The Svetnashki is a new puzzle from the Russian company Mif Predmet and it was invented by Vladimir Krasnoukhov. It's essentially a slide puzzle, but I can tell you, it's much more than that. 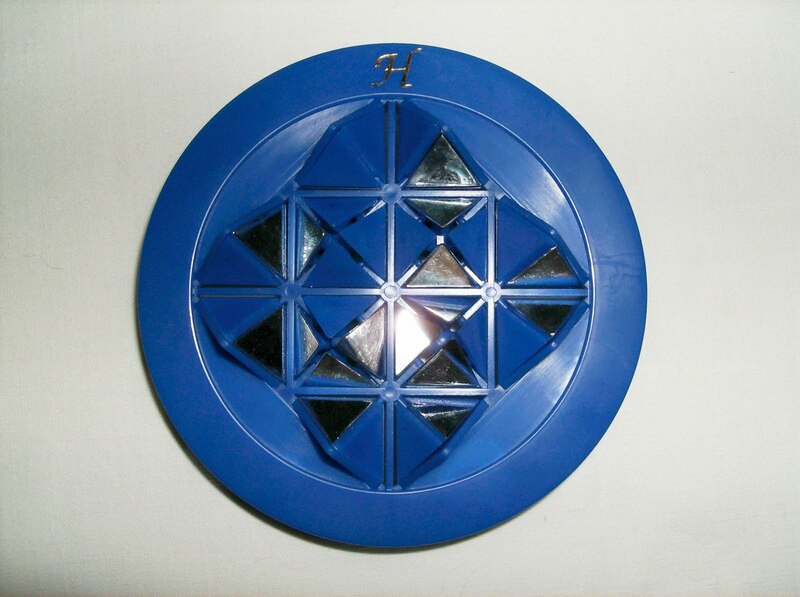 The puzzle uses polarized filters to create a fantastic effect in its tiles, making them transparent or dark. 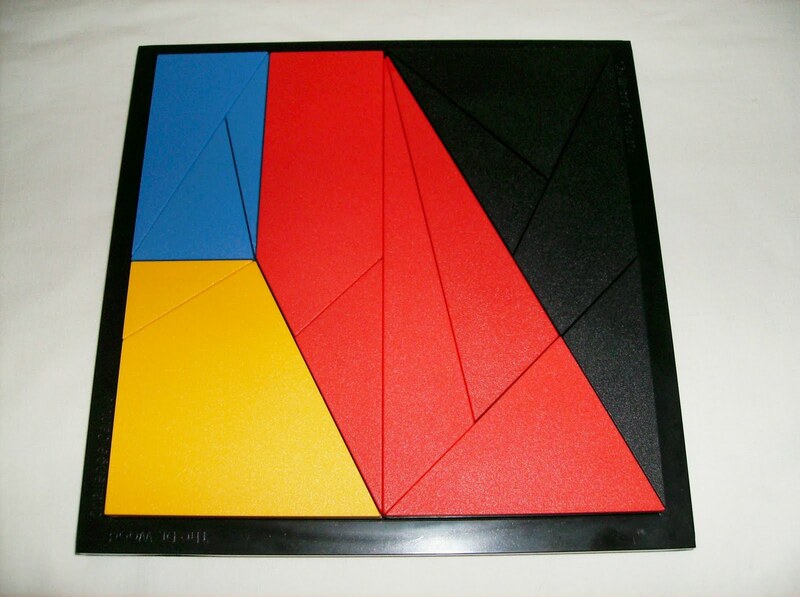 The puzzle has a very pleasant and elegant design (unfortunately, the pictures don't make it justice) and it's this presentation that draws your attention and makes you want it. It's currently one of my favorite puzzles alongside the Qubami. The Qubami Standard, produced by Kelvin Stott, is made with the same materials as the original Qubami. 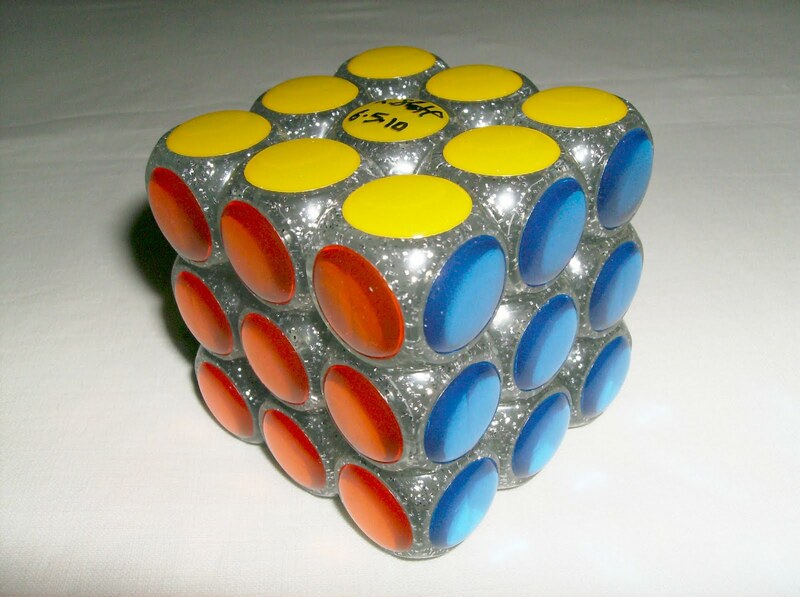 In this puzzle, its author wanted to give the same feel of excellence of the first one and apply that to a normal standard color scheme cube. Now you can actually speedsolve with this one. It also turns very smoothly and cuts corners like the original one. This one has a different base color (silver), but has the same type of metallic stickers, which gives a nice grip on the hands for speedsolving. It has a very nice effect when light is pointed at it, because it reflects light and almost looks that it has its very own. It's truly a work of art and a must have in any puzzle collection. 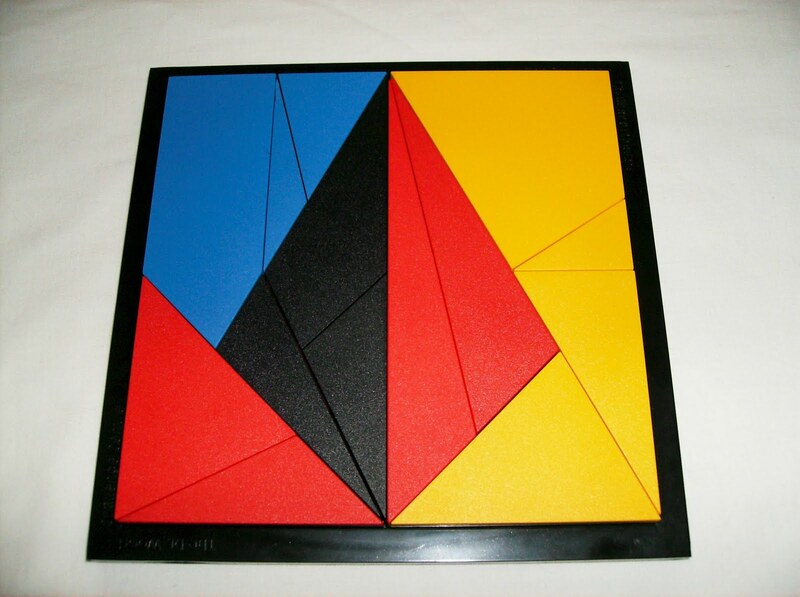 Qubami is one of the most amazing puzzles I had the pleasure to play and have in my collection. It was entered at the 2010 30th IPP Design Competition. 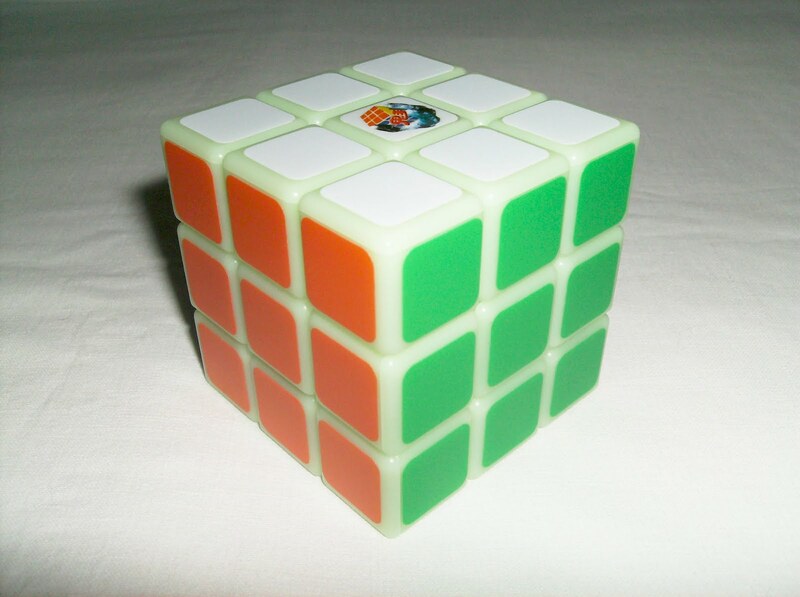 Invented and developed by the Swiss Kelvin Stott, the Qubami is more than just another 3x3 sticker variation. 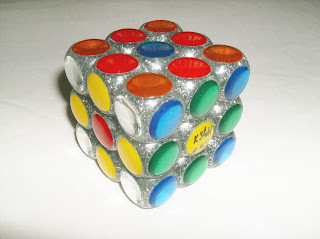 Starting by its great design, which is what caught my attention in the first place, it's composed by metallic stickers (they have a bubble effect and their rubber effect feels very good in the hands) and cubelets that resemble playing dice. It also turns very smoothly and can also cut corners. It gives a great challenge even to the most sharpest brain. 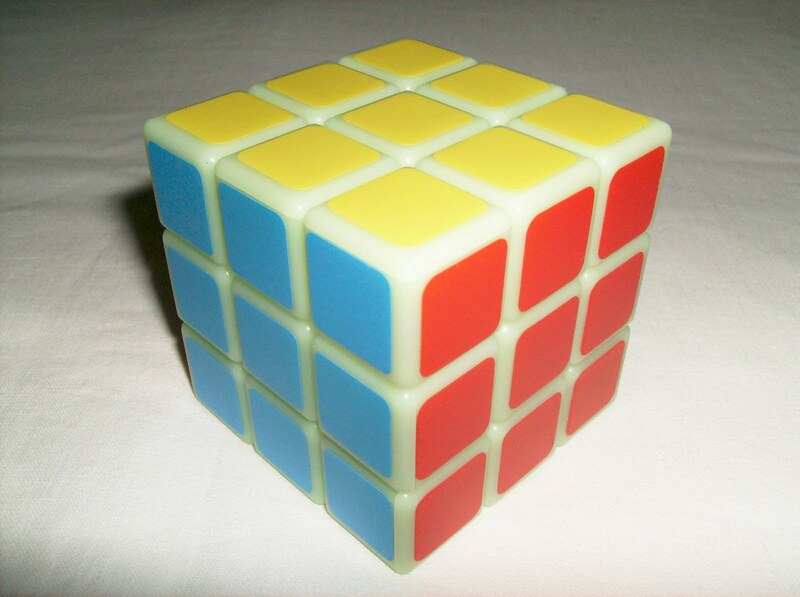 The cube is presented to you with the patern of three colors, one per two adjacent faces. The main goal is to have, in its six faces, one color and one symbol on every vertical and horizontal line (like a Sudoku). For the ones who know how to solve a normal Rubik's Cube, the hard part is trying to figure out the hidden pattern of the solution... 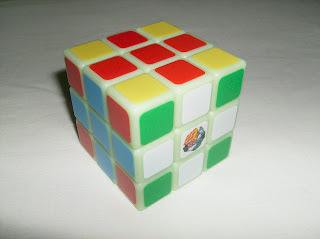 Which is unique in every cube and has only one solution... When you have found the hidden color/symbol pattern, it may not be over yet, because you can come across parity errors, i.e. one edge piece is flipped upside down (it happened to me). To overcome this you have to find at least two identical pieces or one symmetrical and try to swap them to get the final solution. 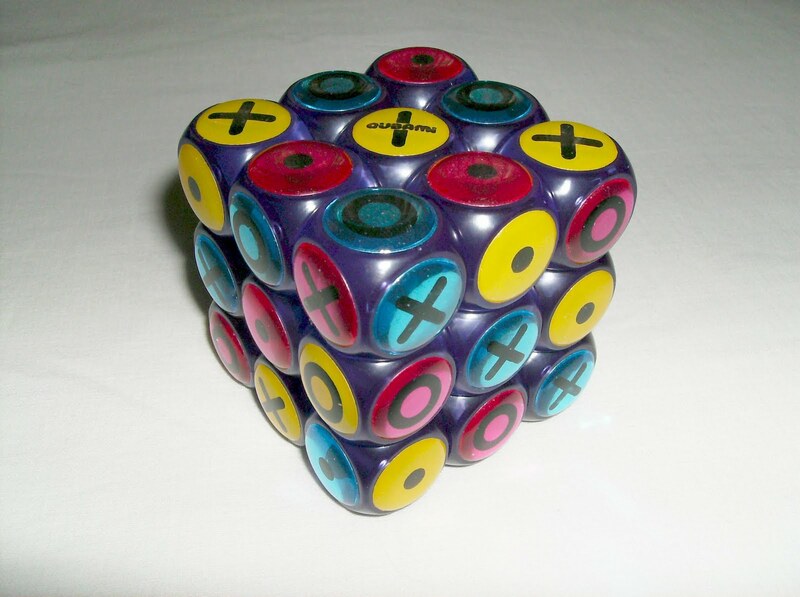 There's other challenges as well, like to solve the cube only by color or by symbol, so there's a lot to keep one entertained for very long. As I said to Kelvin after I solved the Qubami, I've never been so immersed with a puzzle since I got my Original Rubik's Cube. And that was the first puzzle in my collection. After your first try at solving the Qubami, you can't put it down until you have found the solution. It's that addictive! The Qubami is not mass produced yet, so if you want one, you'll have to contact Kelvin directly. You can send him a message through the TwistyPuzzles.com forum (in case you aren't a member, you'll have to register in order to send messages to forum members and to get a puzzle). The current price is $35 USD. 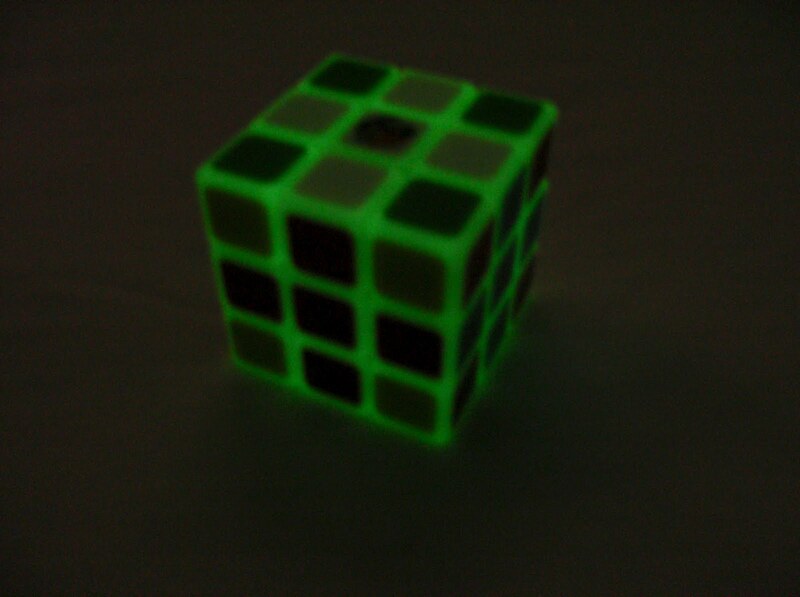 It seems that there's been a lot of glow in the dark cubes lately, so I decided to take a chance with one from those sold in Ebay. I gotta say, I was pretty impressed with it's quality considering that it only cost me around $10 USD. I just bought it for the curiosity of the glow in the dark feature, nothing else. It turns very smoothly and can cut corners very well. 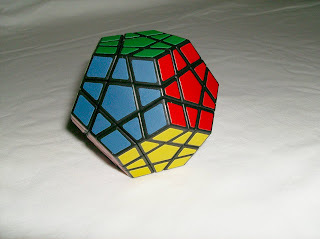 Even though I'm no speedcuber, I can say that you can speedsolve with this one pretty easily. Now to the glow in the dark stuff: At first I was very disappointed with it because I tried it with absolute darkness and I didn't see nothing much. I went on Youtube to find videos about it and found this one that showed a guy pointing the cube at a bright light for a few seconds. Eureka! I didn't know that you had to "charge" the cube with light for it glow. I tried it myself and now I could see it glow like nothing I've ever seen. Now I'm impressed. So, on top of it being so good with speedsolving, it's also very good at glowing in the dark. 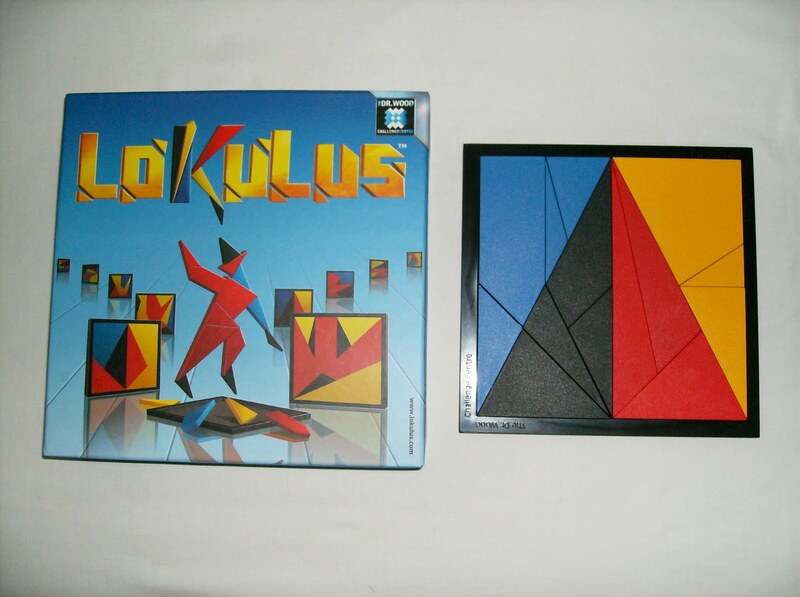 From the same company that produced the Kaleidoscope Classic, Lokulus is based on the famous Archimedes puzzle, Stomachion. 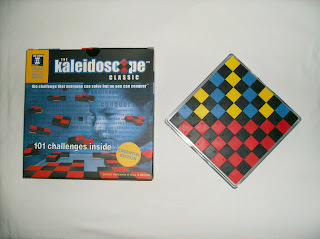 Like the first one, they colored each of its 14 pieces with two of the four available colors (black, blue, yellow and red) and the final product is an amazing puzzle that can create, with its unique challenges, awesome patterns like a cubism painting. 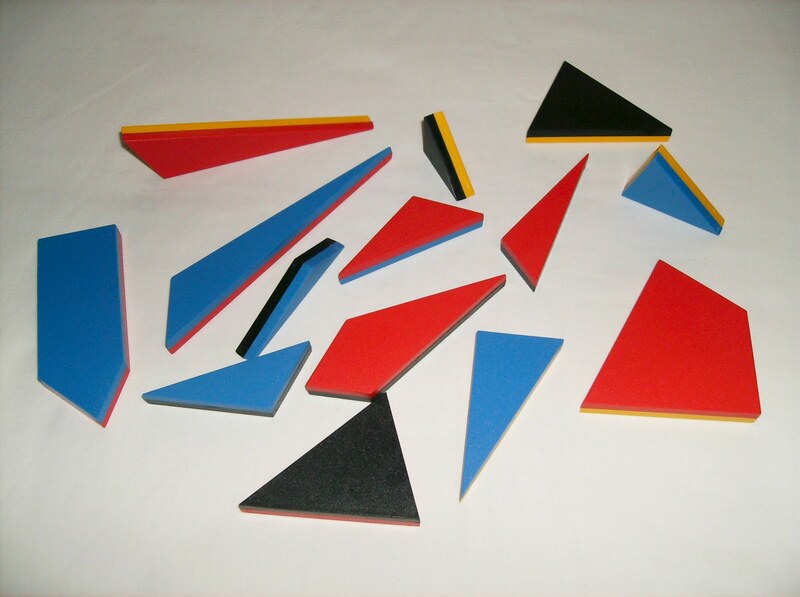 You can also create free-form silhouettes with the pieces like a Tangram puzzle. 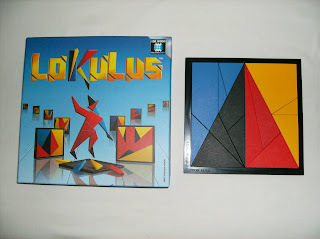 Availability: The Lokulus is widely available at Amazon stores across the globe. Created by The Dr. Wood Challenge Centre, the Kaleidoscope Classic is essentially a packing puzzle. 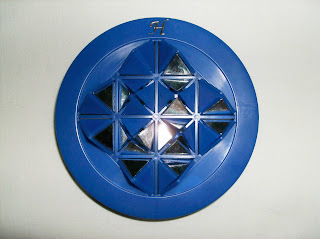 It has 18 pieces, where each piece has a distinct color pattern on both sides. On one side it has black, yellow and blue and on the other side it has black and red. 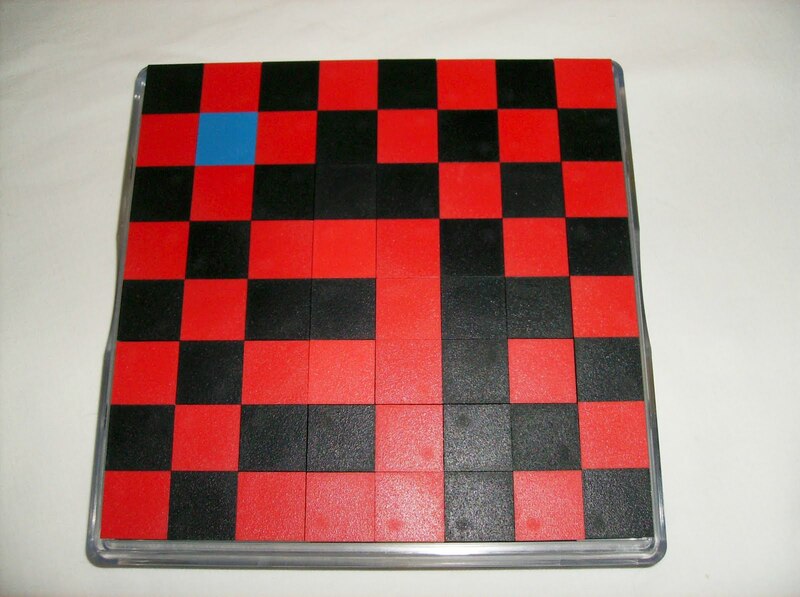 The principle is similar to the Pentominoes puzzle, but it's that color pattern that makes it unique. There's hundreds of challenges you can make with those pieces and you can create your own designs. It's up to your imagination. The Wisdom Ball (a.k.a. Mind Twister) is a ball that has 6 faces, each with a rotating cap with numbers from 1 to 8. 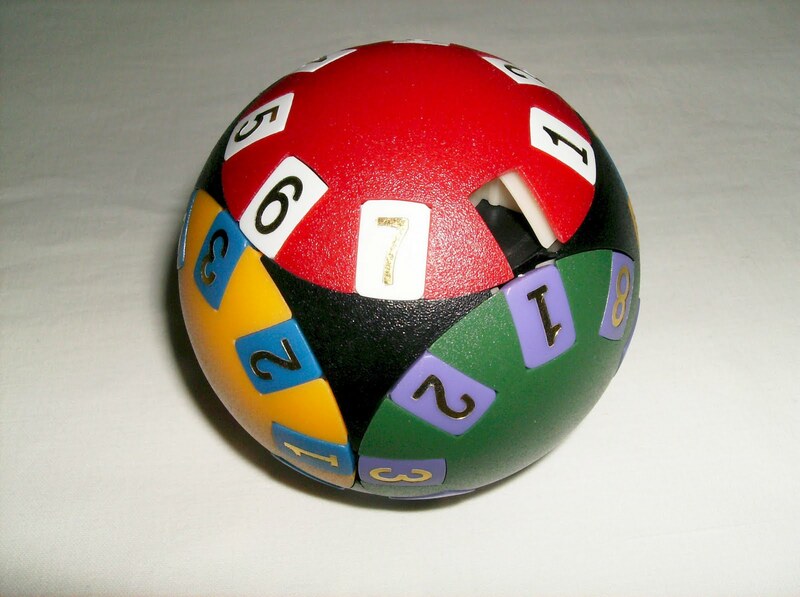 Only the white cap has 7 numbers, leaving the 8th number with a gap where you can swap the tiles from one cap to another, thus allowing you to solve the puzzle. You can make several challenges with it, like having each cap with its correspondent colored number, with a cw or ccw sequence. Watch out for parity problems. 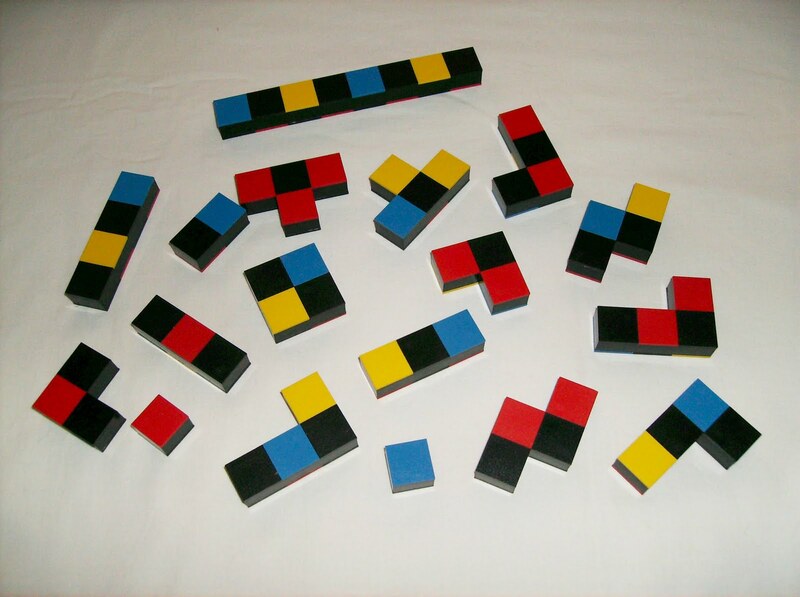 See Twistypuzzles.com on how to avoid this. No it's not a typo. That's the actual name of the puzzle as you can see in its original box. The puzzle is made in Czech Republic and the H you see as the logo is for Hlavolam (Czech for teaser). "The brainteaser is based on the principle of the mirror effect and constructed of a set of revolving octahedrons and half-octahedrons. The brain-teaser is in a composed state, when, looking from a vertical point of view, you see the same color on both sides." You can buy it at Milan's Puzzles. Also available in red. The seller is from the Czech Republic and is very trustworthy. At the time I'm writing this, he still has a few from each color. 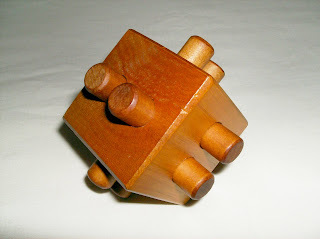 From the Portuguese weekly puzzle magazine, the Albert's Cube is an assembly puzzle. 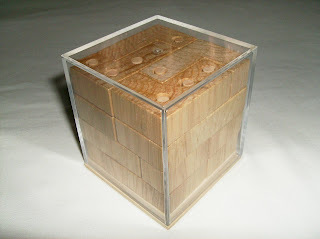 From the Spanish designer Albert Violant, this puzzle adds another challenge to the already difficult packing cube. Formed by 16 L shaped tetracubes and 8 sticks, the Albert's Cube uses every possible combination of drilled tetracubes with the exception of 1, which is undrilled. 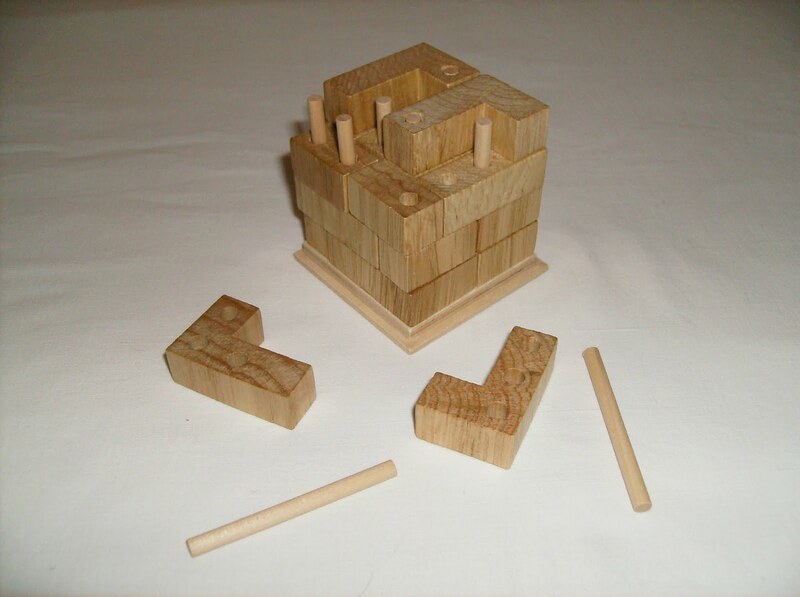 Every L shaped piece is drilled perpendicular to its 4 cube plane, which is going to limit the number of possible solutions, due to the fact that every stick has the same length and has to go through the cube. 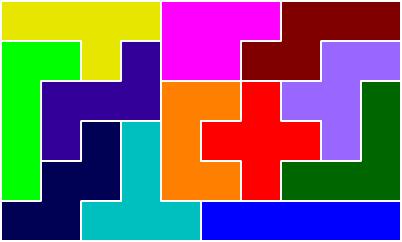 The Albert's cube is closely related to the Stewart Coffin's Corner Block puzzle (see bottom of the listed puzzles in Coffin's page). Another puzzle from the Portuguese magazine collection, the Sequential Cube (a.k.a. 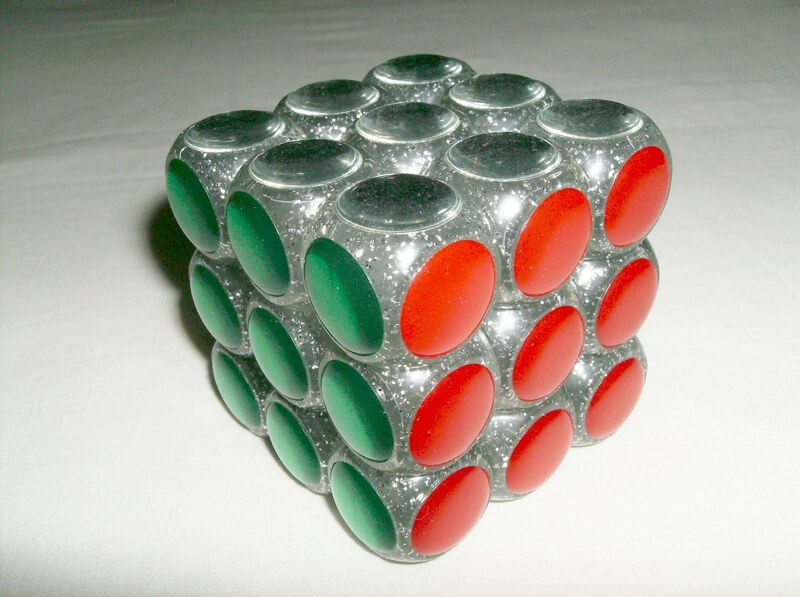 The Clive Cube) is an interlocking puzzle. Like every other puzzle in this category, the secret to solve this puzzle is to find the "secret key" to take it apart. 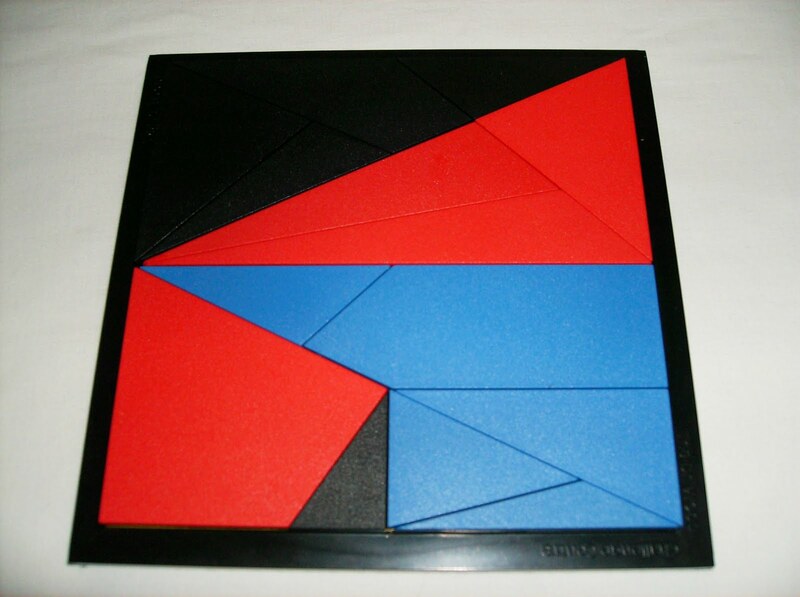 It was presented by Simon Nightingale at the 17th IPP (International Puzzle Party). Similar to the Column Cube, the Sequential Cube presents a deeper challenge. 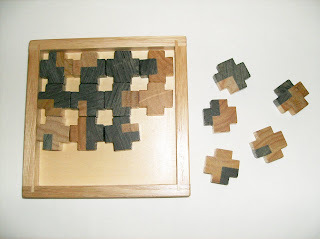 Unlike the first one, where you see how each column is interlocked with one another, here you have to figure out another way to separate the pieces from the puzzle. It's also not that trivial, because there's not a single column that simply slides out. The second challenge, of course is to put the puzzle back together in its original position. Again, not so easy when you can't see what's happening inside the cube. Crossed Crosses is one of many puzzles that are released every week here in Portuguese newsstands. They are released in 40 weekly magazines. 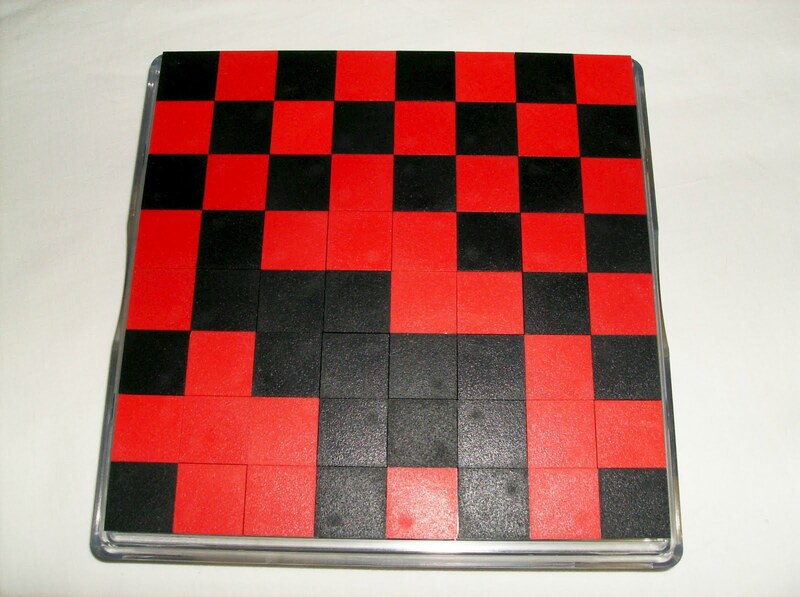 Created by the dutch Niek Neuwahl, the puzzle has 16 pieces and its goal is to have every edge of a cross touch its adjacent pieces with the same color pattern. Also, the two unique color crosses (black and white) can't be used on any of the 4 board corners. Only the upper side of a cross is allowed to work out the solution. As a complement of my website, this blog serves a purpose that I thought of doing a long time ago, but only now had the patience to make it. Its main goal is to share with every puzzle enthusiast, the new additions to my collection. I like to talk about puzzles and this way is exactly how I wanted to do it. Now every time I get a new puzzle(s), I'll make a post here with photos and description along with related links. It's faster than having to wait a few weeks to update the site with new puzzles, although I'll continue to update it regularly. 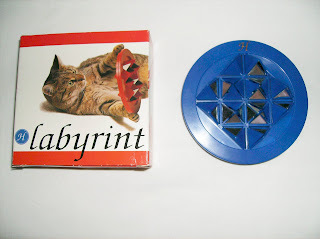 Other than new puzzles, every week I'll be making a post about a random puzzle from my collection and talk about it.